Twenty Spitfires will take to the skies this September as part of IWM Duxford’s Battle of Britain Anniversary Air Show, commemorating the 75th Anniversary of this crucial aerial battle. This mass display of Spitfires, above Britain’s best-preserved Second World War Airfield, will include Supermarine Spitfire Mark I N3200 – recently restored and returned to Duxford by American philanthropist Thomas Kaplan and received by His Royal Highness, The Duke of Cambridge. This Spitfire was originally flown from RAF Duxford in 1940 by Squadron Leader Geoffrey D. Stephenson. The Battle of Britain Anniversary Air Show will tell the story of Duxford’s pivotal role in this famous conflict. In September 1940, some 60 Spitfires and Hurricanes were dispersed every day around Duxford and Fowlmere and on 15 September 1940, known as ‘Battle of Britain Day’, Bader’s ‘Big Wing’, operating from Duxford, twice took to the air to repulse Luftwaffe attacks aimed at London. Visitors can experience what it was like to work at RAF Duxford in 1940 with the re-creation of a Spitfire scramble during the air show. Upon the instantly recognisable sound of a Second World War air raid siren, Hispano HA-112 MIL (Buchon) aircraft will fly in and strafe the airfield. 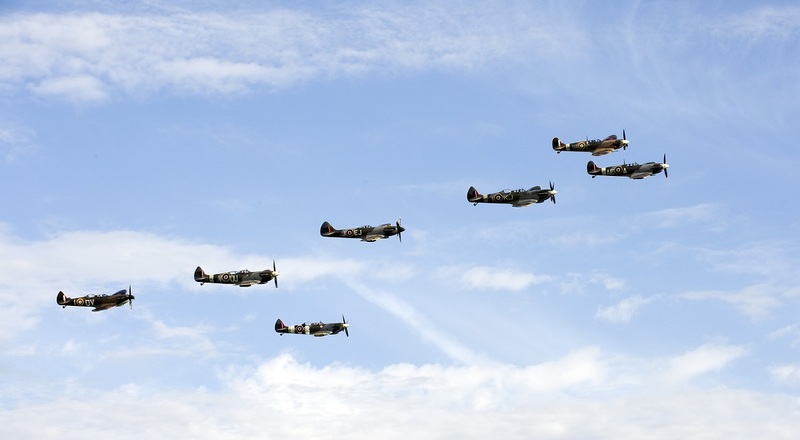 As a scramble bell sounds, living history interpreters representing Second World War RAF fighter pilots will race to protect this vital Battle of Britain airfield and Supermarine Spitfires chase off the enemy aircraft. These extraordinary experiences and sights will give visitors to The Battle of Britain Anniversary Air Show an insight into the life and work of the Battle of Britain fighter pilots who flew from RAF Duxford. The Battle of Britain Anniversary Air Show takes place on Saturday 19 and Sunday 20 September and tickets are only available in advance. NextAIRSHOW NEWS: Old Sarum Air show 12 & 13th September. Tickets available now.